From Wildcat, through Puma, Leopard and Jaguar right up to Tiger (the family of pneumatic piston pumps from J Wagner GmbH) Kirkco offers a comprehensive range from 40 to 1200 cc volumetric flow per double stroke, usable for airless, AirCoat and electrostatic coating and a wide selection of materials. The breadth of the product range, the modular construction and the extensive list of accessories allows the user to find the optimum solution for his specific requirement. All pumps are fitted with the new IceBreaker air motor. The name says it all: thanks to a new internal geometry, icing is minimized so there is no need to interrupt work to thaw out the pump. Other advantages: the pneumatic controller needs no pneumatic oil, and thanks to minimum pulsation a uniform spray jet is achieved. A common feature of all pumps is their easy handling, proven in many ranges of tests. They have a complete integral pressure regulation unit, a hand released inlet valve and large, easily replaceable, inlet and outlet valves for optimal flow even with high viscosity materials. The easily maintained fluid section saves time and thus cost. All pump components which come into contact with the spray material are made of stainless steel. In order to emphasise the reliability and quality of the pumps WAGNER gives a long-term guarantee of three years, excluding wear parts. Pneumatic piston pumps are equipped with an air motor that alternately moves a piston up and down. In this way, the material is drawn out of a container and into an intake hose or intake pipe and put under pressure. While the piston moves up, the ball of the inlet valve rises and the material is drawn into the lower area of the fluid section. At the same time, the ball of the outlet valve is pressed onto its seat and the material is pumped into the upper chamber of the fluid section and into the pressure line leading to the spray gun. During the down stroke, the ball of the inlet valve is pressed onto its seat and the ball of the outlet valve rises. The piston displaces the material into the upper chamber of the fluid section and partially into the pressure line. The piston rod of the air motor is connected with the piston of the fluid section. The motion of the pump piston is produced by the alternating application of pressure on the air motor and is controlled via an air valve. The pump continues to run until the desired material pressure is reached and then moves to its rest position. It only begins running again when material pressure drops because material is being discharged at the spay gun. The nozzle size and the set spray pressure determine the stroke frequency and the air consumption of the piston pump. The material pressure is the result of the applied air pressure multiplied by the pump ratio of the pump. The material pressure is generated by the surface area difference between the piston of the air motor and the piston of the hydraulic part. This pump ratio is specified in the product name. By setting the applied air pressure precisely, it is possible to exercise very accurate control over the material pressure. The intensification ratio in this example is 15. This means that the pump feeds the material at a pressure that is 15 times greater than the air pressure with which the pump is driven. For example, if the pump is driven with an air pressure of 5 bar, the material outlet pressure in our example would be 15 x 5 bar = 75 bar. The second figure is the volumetric flow in cm3 that the pump feeds with every double stroke. In this example, the volumetric flow is 150 cm3. For example, if the pump operates with 20 double strokes per minute, it feeds 20 x 150 cm3 = 3,000 cm3/min = 3 l/min. Produce a high volumetric flow of up to 110 l/min at a low working pressure (max. 64 bar). Produce a low volumetric flow of up to 50 l/min at a high working pressure (max. 530 bar). Primarily used for material transport in large paint supply systems and for low pressure spraying. 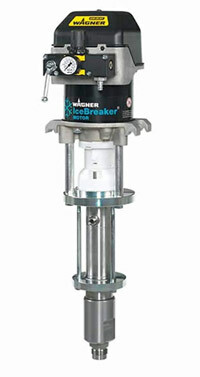 IceBreaker air motors have a low-maintenance fluid section of stainless steel. All parts that come into contact with paint are made of stainless steel. The innovative internal geometry of the air motor keeps icing to a minimum and thus greatly reduces the number of interruptions to thaw the device. The pneumatic controller operates without pneumatic oil. The motor's low level of pulsation ensures a uniform spray jet. IceBreaker Air Motors Provide Decisive Advantages For Practical Use! Minimal Icing Thanks To Intelligent Internal Geometry. Maintenance-Friendly Fluid Sections Greater Efficiency Due To Easy Maintenance And Fast Cleaning! Stainless Steel Construction For Low Wear And Long Life! Packings are seals that seal the piston from the piston guide. Packings can either be static, which means they are permanently attached, or dynamic, in which case they move with the piston. The material used for packings should be chosen in accordance with the material being processed. One of Kirkco technical specialists can assist by providing more information. Piston pumps with explosion protected inline fluid heater Wagner Thermo technology combines the tried-and-tested pneumatic piston pumps Puma 28-40 and Leopard 35-70 with an explosion protected inline fluid heater. This guarantees a constant paint temperature with a maximum outlet temperature of 65 ° C and a maximum working temperature of 80 ° C. This temperature control of the sprayed material reduces its viscosity, achieving better atomisation and quicker degassing. The drying times are reduced, the process characteristics improved and a homogeneous smooth surface is achieved. Not only furniture manufacturers (wear proofing), window makers and carpentry and joinery firms benefit from Thermotechnik, it is also used in heavy steelwork, shipbuilding and plastics processing (e.g. for car accessories). Kirkco covers the entire spectrum of pneumatic spray pump packages used in industrial and contracting protective coating and spray finishing applications. Whether Air-Assisted, AirCoat, Airless or electrostatic, mobile or stationary – Kirkco can provide a comprehensive spray package solution. Kirkco offers protective coating to spray finishing pump packages in a variety of types, sizes and performance classes – from the small low pressure / low volume adhesive spray unit to high pressure / high volume 100% solids coating applications. Whether it’s a window manufacturing company or a shipyard, low viscosity lacquers or high viscosity two-component protective coatings for corrosion protection – our pump range leaves nothing to be desired! You can obtain further information from our product catalog or have one of Kirkco Corporation’s application specialist advise you individually on your particular needs. We will be glad to assist with choosing the correct pump technology based on your application, the chemical composition, flow, and abrasive characteristics of the fluid to be handled. LIQUID AND POWDER PAINTS SPRAY FINISHES. Kirkco offers a wide range of accessories for Binks, Devilbiss, Graco, along with Wagner IceBreaker High Pressure (HP) piston pumps, including hoses, suction systems, base stands, drum lifting equipment, agitators, manual and automatic spray applicator guns and more.